I continue to get e-mail regarding the Pinot Noir IQ Quiz. A reader wrote that with regard to question 28, he felt that the correct spelling of the Burgundy chant was “Ban Bourguignon” and not “Ban de Bourgogne.” I must defer to Peter Mayle’s book, French Lesions (Adventures with Knife, Fork, and Corkscrew) in which he refers to the ritual gestures and lyrics of the Burgundy battle cry as “Ban de Bourgogne.” This chant is accompanied by “rhythmic clapping and arcane signals, a kind of drinker’s hand jive.” When I was in Burgundy, I found that this chant sprung up at the slightest provocation, at any convivial dinner in Burgundy. The starting position is with the arms bent and the hands positioned with the fingers cupped and held up on either side of the head. With the first chorus, the hands are swiveled back and forth from the wrist, rotating like the base of a wine bottle. For the middle chorus, the hands stop swiveling to clap nine times before returning to their original position for the third chorus. This is to be repeated a second time, at increasing speed, before the dinner participants finally recover with the help of a glass of Burgundy. In the last issue of the PinotFile, I gave the “By the Numbers” figures of acreage of major Pinot Noir growing regions of the world. My good friend, David Lloyd of Eldridge Estate, Mornington Peninsula, Australia wrote me to point out that I had omitted Australia. David is known in Australia as the “Clone Ranger’. His interest in clonal selection began when he visited Oregon in 1990 and met Barney Watson, who was studying the flavor profiles of clones. In 1995, Lloyd bought 3.5 ha on the Mornington Peninsula and began a search to understand clonal diversity. David currently writes for a wine blog called www.winorama.com.au. He sent me the following statistics about Australian Pinot Noir. Australia has about 4300 - 4500 acres of Pinot Noir (2004 figures). Gippsland (home of the famous Bass Philip) has but 60 acres of Pinot Noir. Victoria is the largest producer of Pinot Noir because it has many cool regions. Some regions have continental climates (Yarra Valley, parts of Southern Tasmania, and maybe Gippsland) and others have more maritime coolness (Geelong and the Mornington Peninsula). Specific regional Pinot Noir vineyard acreage in Australia is: Mornington Peninsula (Victoria) - 1110, Yarra Valley - 1900, Geelong - 353, Southern Tasmania - 468. The total acreage in Australia currently exceeds that of New Zealand. More on screw tops. A reader writes that first growth Chateau Margaux is doing screw cap trials of the estate’s second label wine, thought to be the first screw top bottling in Bordeaux since Haut Brion bottled a few 1969s with primitive screw caps. In Burgundy, Beaune merchant Jean-Claude Boisset is using the closure for some of his Cote de’Or wines. Laroche bottled some of his Chablis under screw cap in 2003. 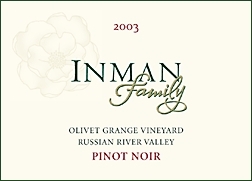 Kathleen Inman of Inman Family Wines is donating 10% of her October on-line sales of 2005 Inman Family Pinot Gris and 2004 Inman Family Olivet Grange Pinot Noir to breast cancer research, education and outreach by a contribution to the Susan G. Komen Breast Cancer Foundation. 707-235-2071 or www.inmanfamilywines.com. There is a terrific wine blog written by winemaker Kent Fortner of Green Truck Cellars and sent out by e-mail. Sign up at www.greentruckcellars.com. Kent keeps you up to date with the progress of his winemaking from harvest to bottling in a very personable and humorous style. If you ever had the inkling of making wine, read this first!